Biology External or internal parasitoids of a wide range of insect orders, but mainly Lepidoptera, Coleoptera, Hymenoptera and Diptera. 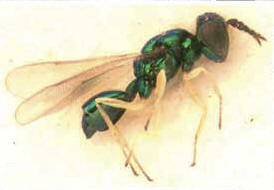 A few species are phytophagous, and some are predators of gall-mites or nematodes. Gibson A.P. 1993. Superfamilies Mymarommatoidea and Chalcidoidea (pp. 570-655). In GOULET, H. & HUBER, J. (eds). 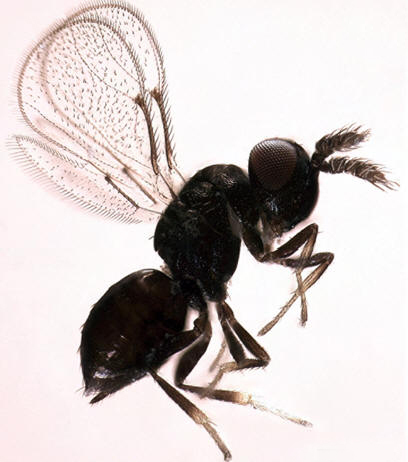 Hymenoptera of the World: an identification guide to families. Research Branch, Agriculture Canada, Ottawa, Canada, 668 pp. Hansson, C. & Straka, J. 2009. 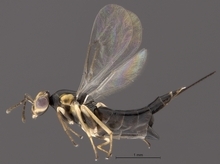 The name Euderinae (Hymenoptera: Eulophidae) is a junior homonym. Proceedings of the Entomological Society of Washington 111: 272–273. La Salle, J. 1993. Aprostocetus (Ootetrastichus) theioneurus (Masi) (Hymenoptera: Eulophidae): a hyperparasitoid on the cereal stem borer Chilo partellus (Lepidoptera: Pyralidae) in Africa. Zoologische Mededelingen, Leiden 67: 445-451. Masi, L. 1917. Chalcididae of the Seychelles islands. (With an appendix by J.J.Kieffer.) Novitates Zoologicae 24:121-330. Photographs © Simon van Noort (Iziko Museums of South Africa) or © Janine Kelly (Biosystematics Division, Plant Protection Research Institute, Agricultural Research Council, Pretoria). Citation: van Noort, S. 2019. WaspWeb: Hymenoptera of the Afrotropical region. URL: www.waspweb.org (accessed on <day/month/year>).